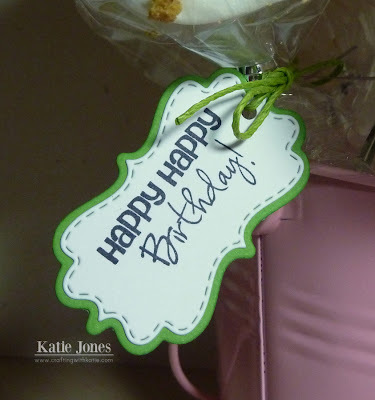 One of my coworkers was celebrating her birthday this week, and I thought it would be fun to surprise her with some tasty treats: White Chocolate S'mores! 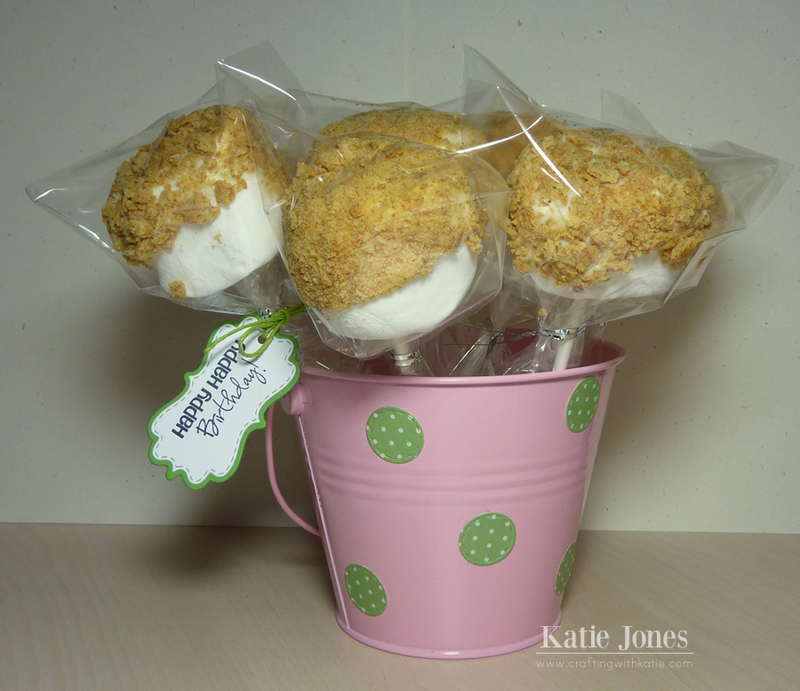 They are a fun, EASY twist on cake pops. 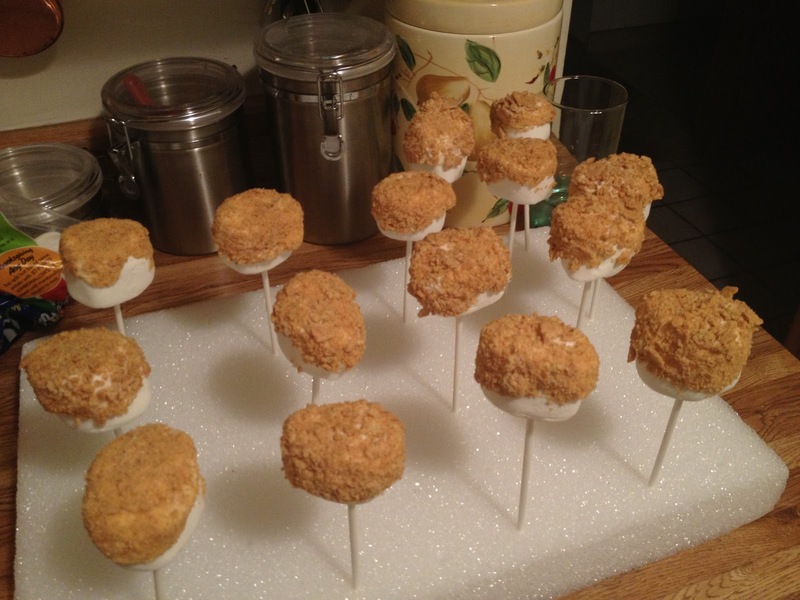 I love cake pops, but they are rather time-consuming to make. 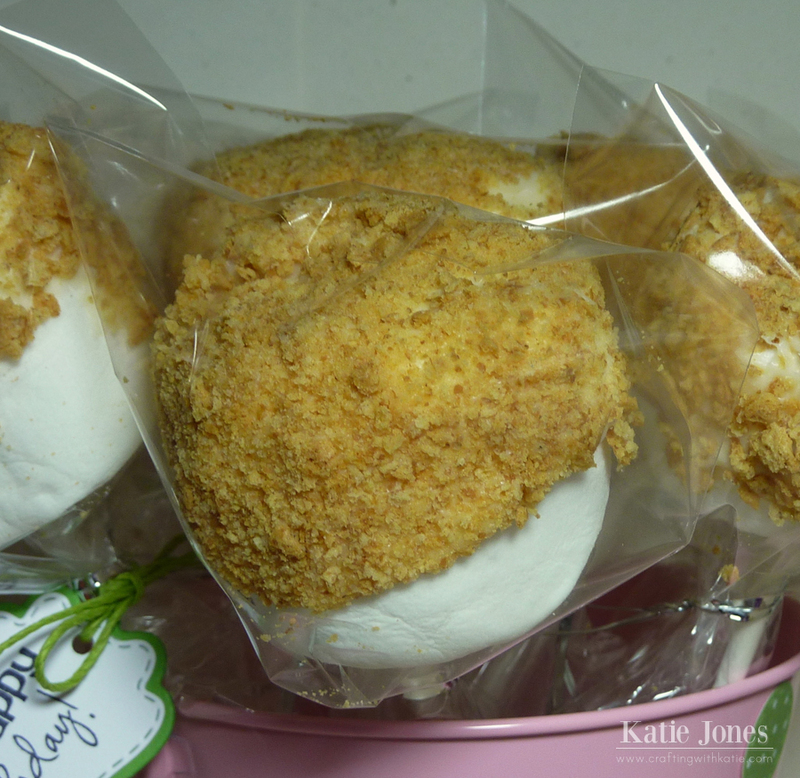 The White Chocolate S'mores take very little time to make, and you can make as many or as few as you like at one time! I packaged each S'more in a clear cellophane bag secured with a twist tie. I happened to have this pink pail, which I filled with some dried white beans to hold up the S'mores. 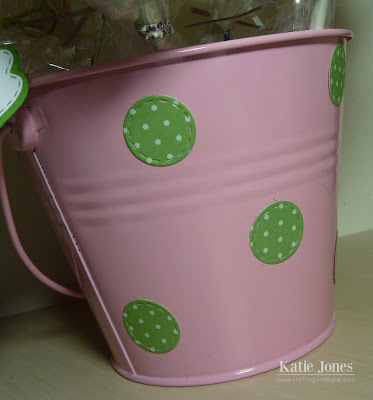 To decorate the pail, I used the little stitched circle die from My Creative Time's Build a Banner Kit and made polka dot stickers. 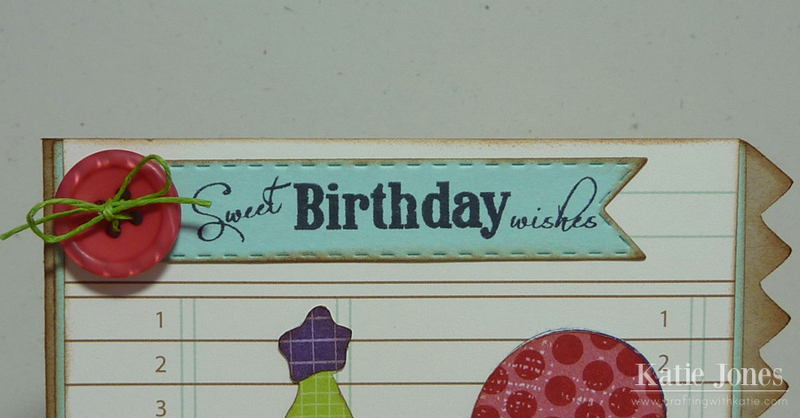 The adhesive backed paper I used is from a DCWV pack I got on clearance a couple of years ago. I haven't used it much, but this was a perfect place for it! On one of the S'mores I tied a cute little tag made with the MCT Curly Label and Stitched Label Dies, stamped with a sentiment from Wow! So Many Candles. I tied it to the S'more with my favorite green hemp from Liz's Paper Loft Boutique. There are lots of recipes out there for S'mores. Most call for chocolate, but since I didn't have any, I used the Wilton's white chocolate candy melts. To make these, I simply melted some of the candy melts in the microwave, according to the package directions. Then I dipped a lollipop stick into the candy melts and then into a jumbo marshmallow. After that I dipped the marshmallow into the candy melts and then rolled it into graham cracker crumbs that I had crushed. That's it! I have a big piece of styrofoam that I use for cooling cake pops, so I used it to let my white chocolate harden on the S'mores. Very easy, and oh, so tasty! Also, be sure to stop back here tomorrow. 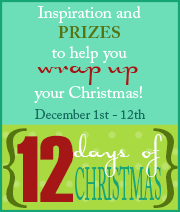 It will be the first day of the annual My Creative Time 12 Days of Christmas! 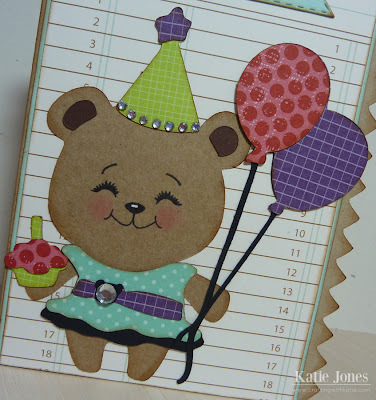 We will have lots of fun projects to inspire you, as well as some awesome giveaways! I thought I would try something new with this card. To make my side panels, I used my Scor-Pal to score one inch in from each edge. 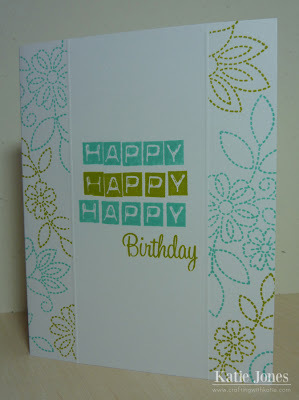 I then masked off the center panel with post-its and stamped flowers from Papertrey Ink's Stitches & Swirls stamp set, using Simply Chartreuse and Hawaiian Shores ink. 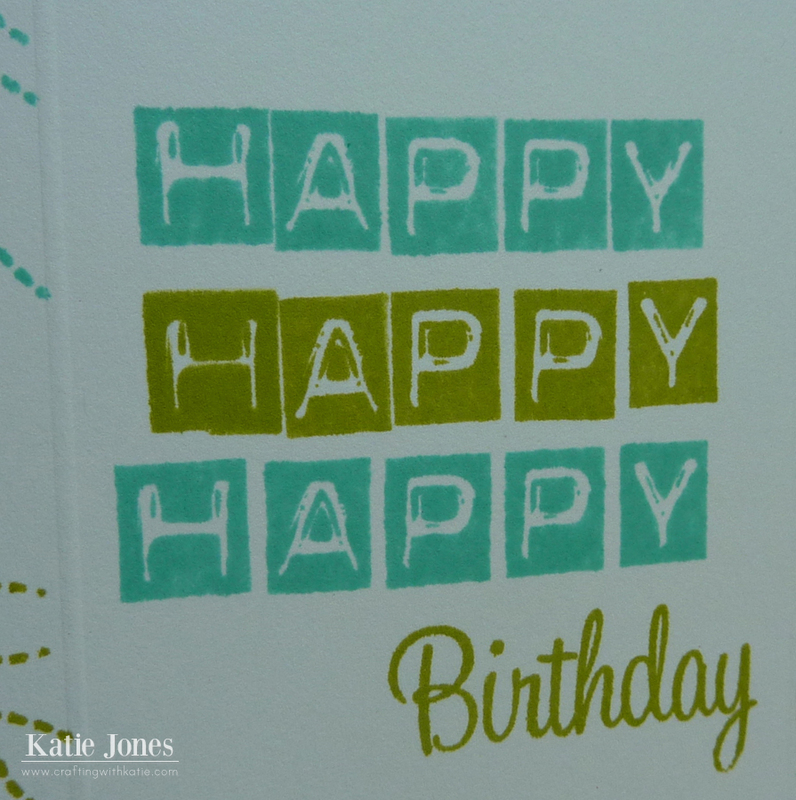 In the center panel, I stamped "HAPPY" several times, using the letters from My Creative Time's Label Font. I then added Birthday from MCT's Celebrate Good Times. Pretty simple, but I kind of like it! Today I'm the featured designer for Jinger Adams, and I'm sharing a fun 3-D paper ornament that I made with Jinger's beautiful Bella Vita papers. 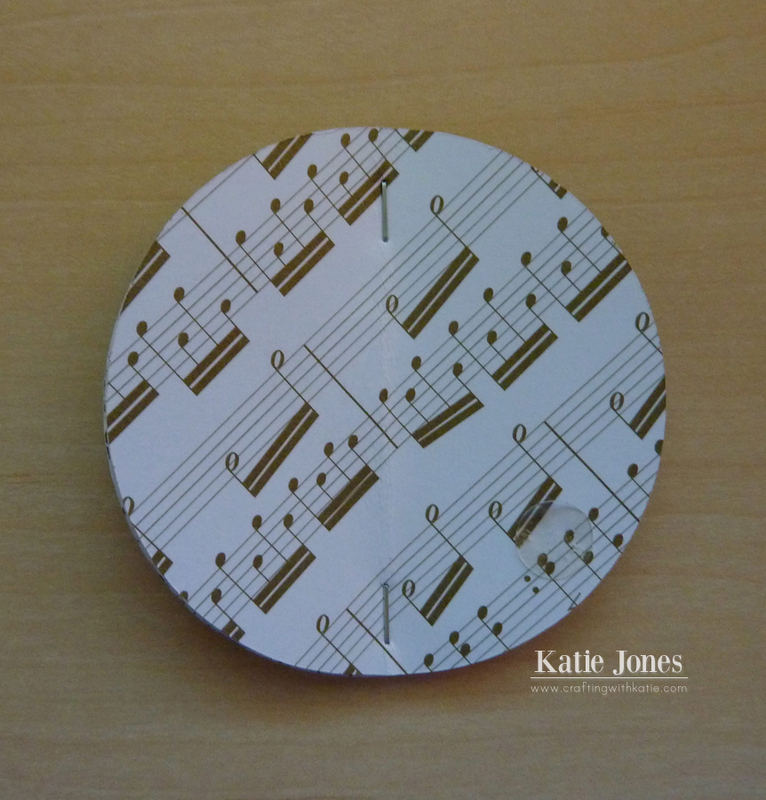 I started by using my Silhouette Cameo to cut twelve 2 1/2" circles from the music paper. 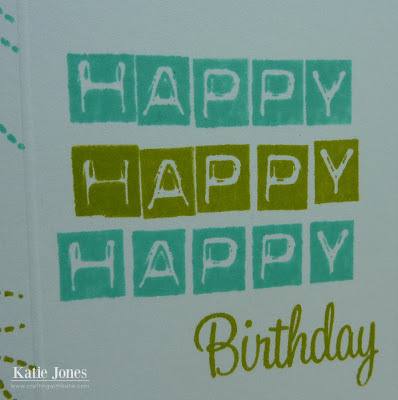 This paper is great for everyday occasions or for Christmas! 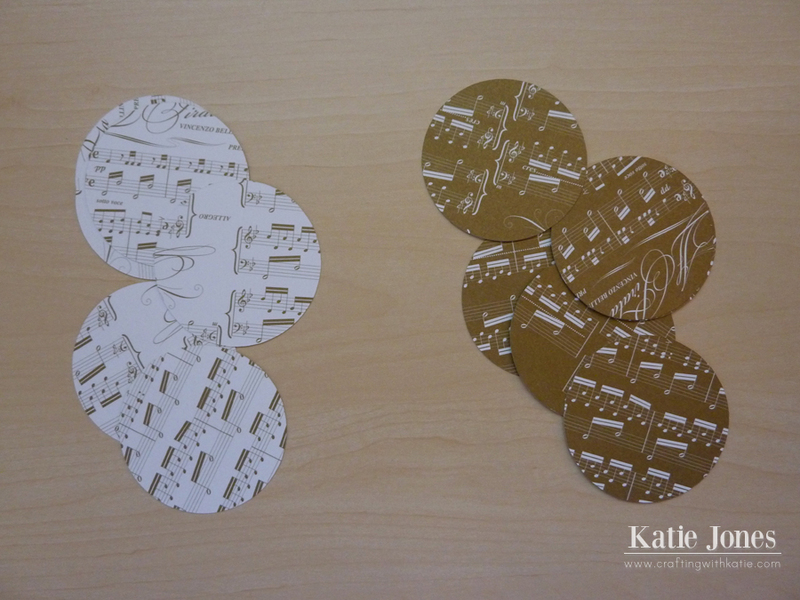 It's double sided, and I turned 6 with the white side up and six with the gold side up, scored them down then middle, and then arranged them in a stack with two white, then two gold, two white, etc. Next I stapled twice in the crease, once at the top and once at the bottom. The last step is glue dots. I placed one about a third of the up from the bottom, and pressed the two sides together. On the next section I put the glue dot a third of the way down from the top, pressing the two sides together. 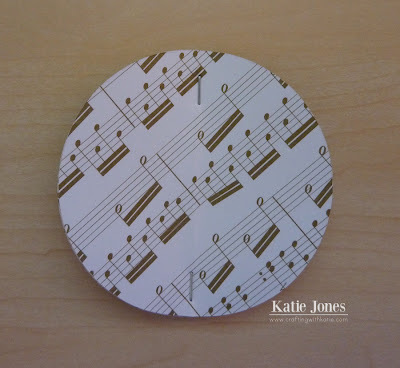 I continued around the circle in this manner, alternating the glue dot positions. Finally, I added a little trim from Jinger's Gypsy Queen collection. Here's the birthday card I made for my niece, who is turning eight next week. 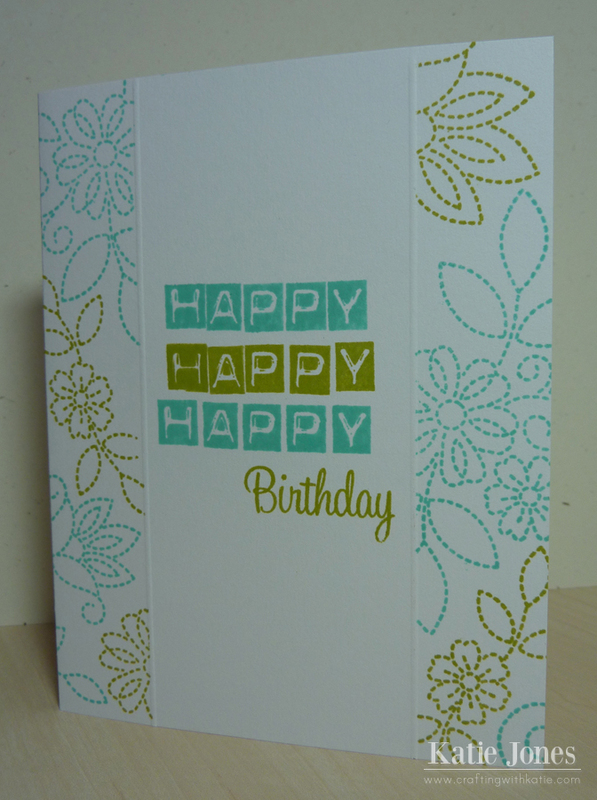 To make the card base, I took a cut from the Cricut Elegant Edges cartridge and sized it at 5 1/2". 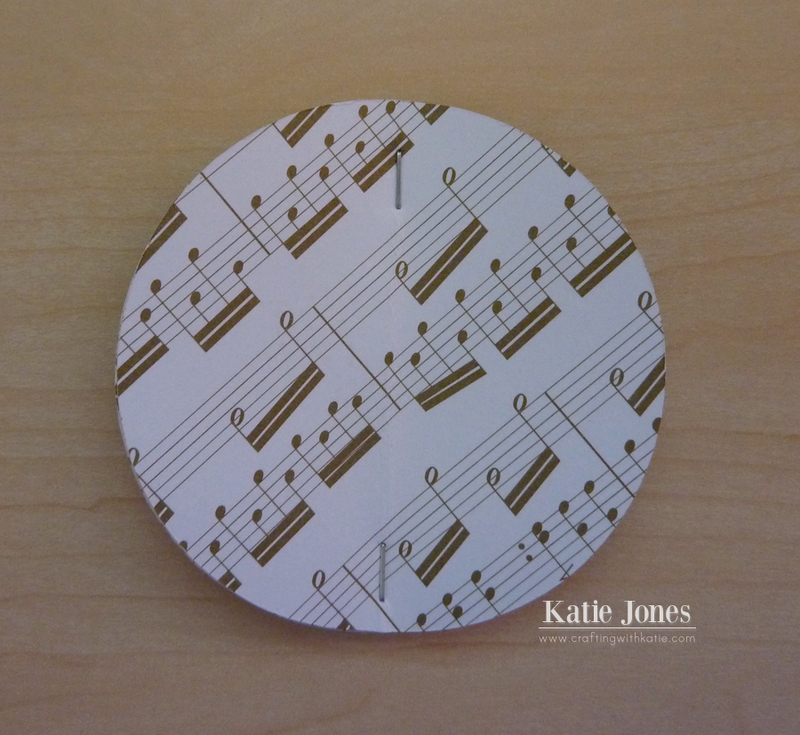 I then duplicated it, flipped the copy, and overlapped the two enough to make the entire width 8 1/2". 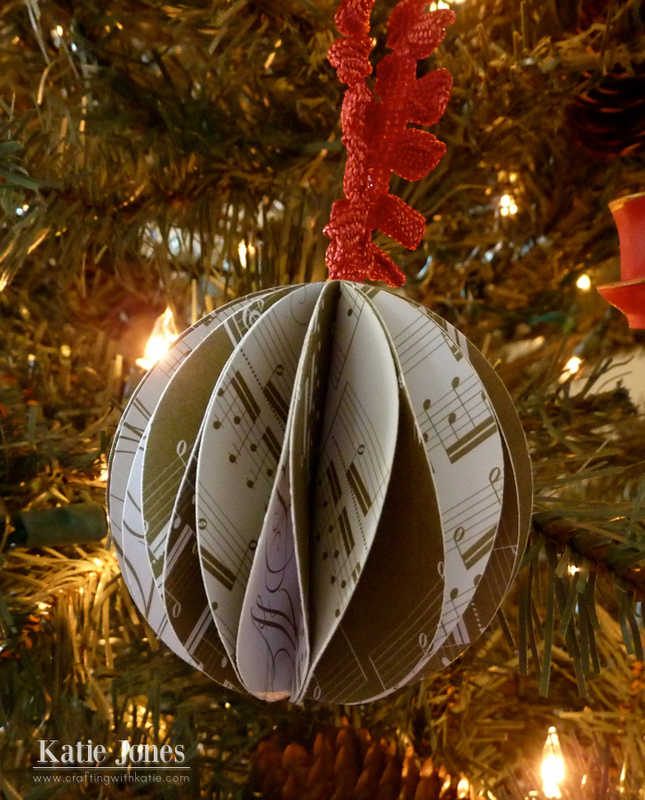 After welding the two together, I cut it and layered it with a piece of aqua cardstock and some patterned paper. The adorable teddy bear is cut at 3 1/2" from the Teddy Bear Parade cartridge. 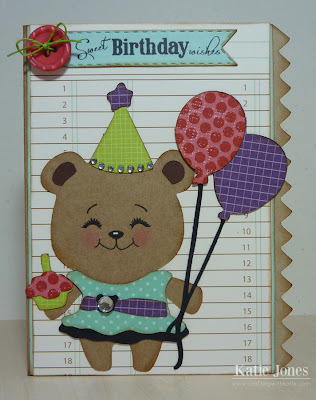 Her accessories are all part of the same cut, but I changed the clothing by pulling the dress from a different bear. Her face is a Peachy Keen stamp, and I accessorized her with some i-rock gems. To make the sentiment, I die cut a banner from the My Creative Time Vintage Label Dies and added a sentiment from Vintage Sentiments. A Fancy Pants button and green hemp from Liz's Paper Loft Boutique were the finishing touches!